If your pup’s tired of getting stuffed under your seat during long flights, you may want to try out American Airlines’ new pet cabins, which they’re affectionately calling “Cuddle Class.” The snug cabins have vented doors and let pets sit adjacent to their owner’s seat, which lets them see their best buddies during flight and, hopefully, keeps them a bit more relaxed. The pet cabins don’t come cheap, as they’re only available in First Class suites. 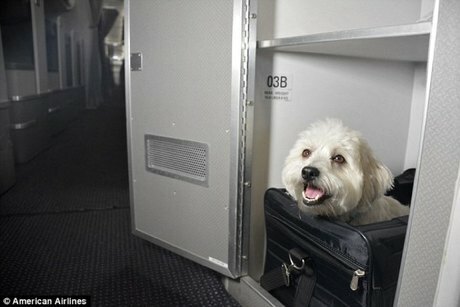 For the initial roll-out of the pet cabins, they will only appear on flights from New York to Los Angeles and from JFK to San Francisco. While Cuddle Class will only be for a limited few passengers and their lucky dogs and cats, at least it’s a step in the right direction to make flying more comfortable for our furry friends. Anything that lets us stay close to them and keep them from being stressed is fine with us. And at least they can beg us for some of our airline peanuts.